When it comes to SEO (Search Engine Optimization), WordPress is top of the line. And if you use a theme from a professional source like StudioPress or WooThemes, your theme is designed to take advantage of the power of WordPress SEO. But if you want to really optimize your site’s SEO and take it to the next level, you need an SEO plugin like WordPress SEO by Yoast or All in One SEO Pack. What does an SEO plugin do that WordPress doesn’t already? 1. Customize the display title of your site. You set your site name and tagline in the General Settings, but what if you want something slightly different to appear to search engines? An SEO plugin gives you that advantage. For example, maybe your tagline fits you but isn’t filled with keywords. By default, if you have your latest posts appearing on the main page of your site, the title that appears to web browsers and search engines would be: Site Name | Tagline. But with an SEO plugin, you could change it to: Site Name | Tagline | keyword phrase. If you’ve created a custom home page, an SEO plugin is even more important. If you’ve called your custom home page “Home” so that it appears as “Home” on the navigation menu, then “Home” may be what Google and everyone else will think your site’s home page is called unless you customize it to display your actual: Site Name | Tagline. 2. Customize the search engine titles of your posts and pages. On a WordPress site with default settings, your post or page name would be all that appears on Facebook or in search results. With an SEO plugin, the automatic setting is usually “Post Name | Site Name” (but it can be customized endlessly). It also appends your site name to your category and tag archives. You can also change your post or page titles on an individual basis. That means that you can title your post “A Really Catchy Title”, and that’s what will display in the post title itself, the recent posts widget or as the subject line of your feed via email. But you can customize the title for SEO purposes so that “A Really Catchy Title: Great Keywords | My Site Name” is what displays at the top of the browser, on Facebook, and in search results. 3. Customize preview snippets displayed on social networks and in search results. If you’re including a disclosure at the top of a post, or a personal note before a guest post, that might not be the part of your post that you want everyone to preview when they see a Facebook like of your post or see your post in search results. Using an SEO plugin, you can create your own custom preview snippet that will be displayed on social media and in search results. This should be catchy and filled with relevant keywords—it’s your one chance to make them want to click and read more. 4. Analyze your SEO as you type. How many bloggers do you know that have written compelling, keyword-filled, search-engine friendly content from the very beginning? Probably not many. Using an SEO plugin to analyze your content as you create your posts is the best way to learn “on the job”. All you have to do is tell it the keyword phrase you want people to be able to find you by, and it will grade you on how well you did—and tell you what to improve. Don’t miss my friend Trina Holden’s post: What Yoast Taught Me about Great SEO. 5. Google authorship, Facebook Open Graph, and other meta. 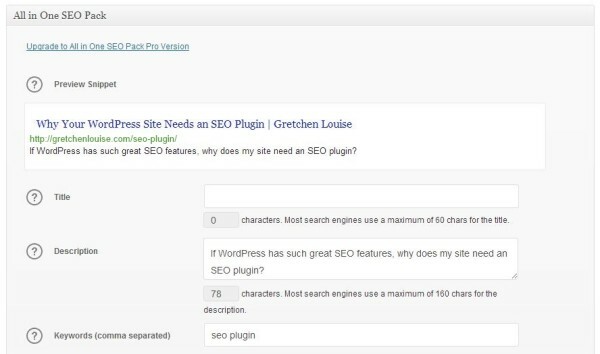 An SEO plugin like WordPress SEO by Yoast helps optimize your site for more than just Google search results: it gives you options to optimize your blog for Facebook, Twitter, Google Webmaster tools, and more. Facebook Open Graph meta data tells Facebook what images and description to display when someone likes or shares a link from your site. It also links your website to your Facebook page or profile, which helps boost Facebook algorithms in your favor. What does Facebook think of your site’s current settings? Check out the official Debugger from Facebook. Simply enter your home page or a post URL and see what they have to say. 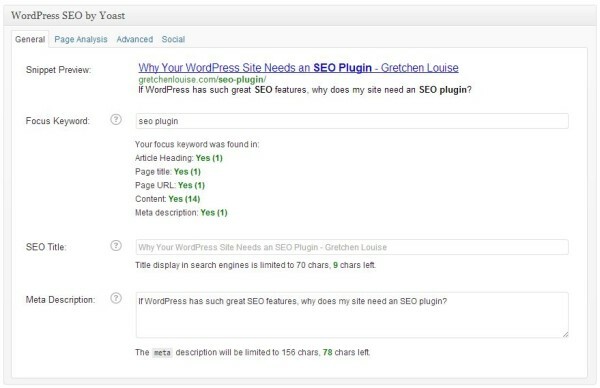 You’ll likely want to install WordPress SEO by Yoast after you see the Open Graph warnings. Here’s a run-down of a few of the most popular SEO plugins. WordPress SEO by Yoast: This is the ultimate SEO plugin, by Joost de Valk, a respected leader in the WordPress world. This plugin won’t just optimize your post titles and give you every social media meta option; it will help you create SEO friendly content as you type, allow you to edit your RSS header and footer, generate XML sitemaps to submit to Google, ping other search engines when you update your sitemap, and even gives you the option to create “breadcrumb” links on every post and page. Check out WPBeginner’s guide to installing and setting up WordPress SEO by Yoast, Beginner’s Guide to SEO: How to Optimize Your Blog Posts, and Yoast’s own SEO Tutorial. All in One SEO Pack: One of the most popular SEO plugins (based on download count), I used it for years in conjunction with the Google XML Sitemaps plugin (which is now built in). But when I realized that Yoast could do everything All in One did, along with the work of several other plugins I was using, I switched. All in One SEO Pack does not include Facebook Open Graph Meta options, though it does have a spot for Pinterest verification. Additionally, All in One SEO Pack does not analyze your post’s SEO, but simply provides spots for you to fill in Title, Description, and keywords (with no control over social snippets in the free version). There’s also a Quick Edit option for updating your description and keywords. Check out WPBeginner’s User’s Guide to All in One SEO Pack. Scribe (paid): This plugin comes recommended by professionals like Michael Hyatt. While plugins like Scribe don’t have all the other options for optimizing your site, they are there for one purpose: to help you create SEO friendly content. What SEO plugin do you use? Yoast tip: If you get a 404 error adding a Facebook admin in Yoast’s Social settings, remove &link=https://www.facebook.com/yourusername from the 404 error URL–leaving #_=_ at the end of it–and hit enter to reload the edited link and it should connect your account. I don’t worry about always getting a perfect grade. You can write a perfectly SEO optimized post and get a red grade simply because you never entered a keyword in Yoast. It can’t grade you if you don’t enter a keyword. However, as to your short page titles, you can make the page title longer and then simply shorten it under Appearances, Menu if you like. Really nice post, altho I’ve got a bit different problem. For non-front pages og:image is displaying correctly, picking only one image, which is nice. Oh never mind. Lol! I’m a dummy. Read the post and links, Rosann. 🙂 I see your link above.